Was rummaging through the sale bin in my local supermarket and found this for 1eur so figured I'd get one. Haven't still watched it but probly will some night this week. Heard of it from my son but haven't seen it. He said it's well worth watching. its definitely worth watching, theres also another one called 'Faster', its mostly about the transition from two to four stroke bikes. Its a good watch for sure. If you like GP, you'll especially like it. The opening scene in the documentary is JLo V. Rossi, Jerez '09 last lap, which is great because they show you footage from the Italians and the Spanish. As others have mentioned, check out Faster as well. Last edited by Conrice; 09-29-2014 at 04:41 PM. Well the thing is I`m not that much into MotoGP but kinda figured IF there`s gonna be a track 40mins from our house I might aswell try to get into it. After all it wasn`t that much of an investment I`ve watched most of it now, was super tired when I got home from work and dozed off at some point so gotta go back a bit lol. What has surprised me a bit is how much the guys brawl with each other on the bikes. As they say in the video it`s not a contact sport. If someone would ever come near enough me to rub elbows in mid corner while going round a track on a motorbike teh track officials would have their hands full digging either me from the tire walls or my fist from the other guy`s helmet... but I guess that`s one of the reasons why they are there making piles of cash and having fun and I`m sitting on my computer typing to a forum! Last edited by Mattson; 10-01-2014 at 03:12 PM. Valterri Bottas is having a great rookie seasoning F1 right now, or at least as much as I've followed this season. I will admit that it's entertaining, but I focus on GP. It killed me last year not having access to TV coverage of most of the races when I was moving. Faster is pretty good flick too if you get into it. And if the two-stokes peak your interest, there was a mini series called "The Unrideables" that is really good too, which focuses on the late '80s - early '90s with Gardner, Lawson, Rainey, Schwantz, and Mamola. Have you seen this? I saw this at movies last year or the other when it was run in the movie theater few times. With 3D it was just mind blowing. Last edited by mika_u; 10-01-2014 at 04:00 PM. Haven't heard of it but now that I know it I must see it! A friend of mine has lived on the island a few years and told me once he got front row seats to a terrace in front of a local pub. There's a small crest just before the bar so it was interesting to see the bikes zoom by just on the other side of the hedge. About a meter off the ground. 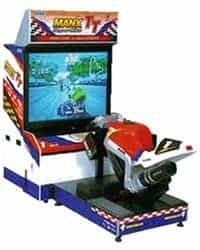 Always had a bit of a soft spot towards that event, I remember back when I was a kid when we used to travel a lot I always went to the local arcade to play those coin operated games, I always checked first if they got the ManX TT Superbike! FASTEST the movie is shipping in the US!